To configure a mail client (like Outlook or Thunderbird) it’s necessary to know your email server settings: that is, both the POP and SMTP parameters of your email account, and some other information concerning the port number you want to use, the authentication process etc. More in detail, the SMTP server is in charge of the email delivery process, while the POP server takes care of the final pick-up of the message by the recipient (downloading it on her client). (This in particular is for the SMTP or outgoing mail server settings). 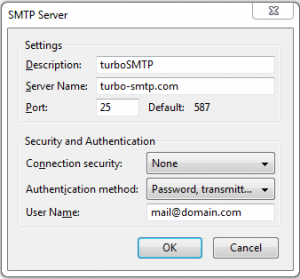 Below you will find a list of the most popular SMTP and POP hostnames: and for all other information about how to set them up, you can check this article. One last thing: if you need to send a mass or multiple email (like a newsletter) you should choose a professional SMTP server to ensure the best delivery rate. In fact, a common outgoing mail server like Gmail’s or Yahoo’s is not designed to support bulk mailings and always set a limit to the number of recipients that you can handle per message.